Hello dear readers and a special hello and welcome to my two newest followers Ryan and Dave, glad to have you onboard. I came across some notes I had made on my computer at the start of the year for things I must achieve during 2013. One of those things to achieve was to find and photograph a Raft spider (Dolomedes fimbriatus). I first came across one of these a couple of years back on an Open University course held at Preston Montford, Field Studies Council centre. A lovely place set in idyllic surroundings, but this particular day we were away from the centre visiting a bog, who's name escapes me. The spider was in amongst the rushes on the near bank guarding a rather large black ball of baby spiders. It was quite an impressive spider and when I heard last year that they were re-introduciong it to Redgrave and Lopham fen, I stuck it on the list. The fen is a reserve run by Suffolk Wildlife Trust, just west of Diss on the Suffolk/Norfolk border. There's ample car parking space, a picnic area with picnic tables and an education centre, which was closed when I went there as they had some event on. There's a site map notice board showing various walks and next to that there are some A4 weatherproof holders with laminated copies of the routes inside, a really good idea. I however, decided not to use these and trust my own sense of direction, which is usually pretty good. But it turned out I didn't need it as the routes are quite well signposted and the paths are well managed and easy to follow. I chose to follow the 'Spider Route' for obvious reasons and before I knew it I came across various webs glistening in the morning sun as the webs were still heavy with dew. Now, for the arachniphobes amongst you, you might have guessed where this particular blog is going considering I'm looking for a particular spider. The next picture you're about to see is that of a spider, but fear not, it's only a picture, it won't harm you, YOU ARE SAFE! It's the only picture of a spider I will show you this time, so take a deep breath get past this picture and everything else will be plain sailing from here on in. 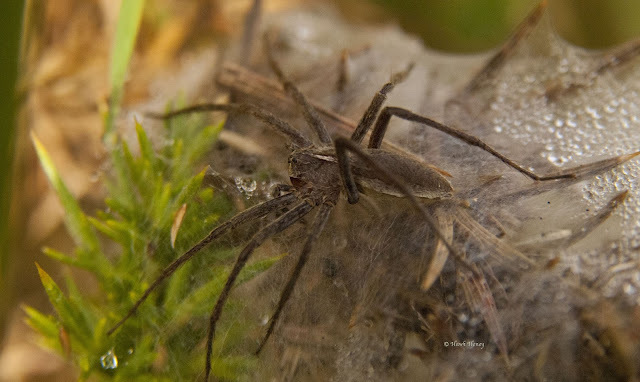 So to the photo and unfortunately, it's not a picture of the Raft spider I was looking for, instead it's a Nursery Web Spider (Pisaura miribilis) which was quite happy to pose for me. The spider route is apparently 2km long and the raft spider likes to sit on nice still ponds with its front legs resting on the surface so it can pick up vibrations off the water, a bit like a pond skater does. I knew the ponds were a nearer to the end of the route so I continued further on. The sun was shining and it was looking to be a wonderful sunny day. Already the rushes around me were a buzz with lots of butterflies, especially Peacocks (Aglais io). 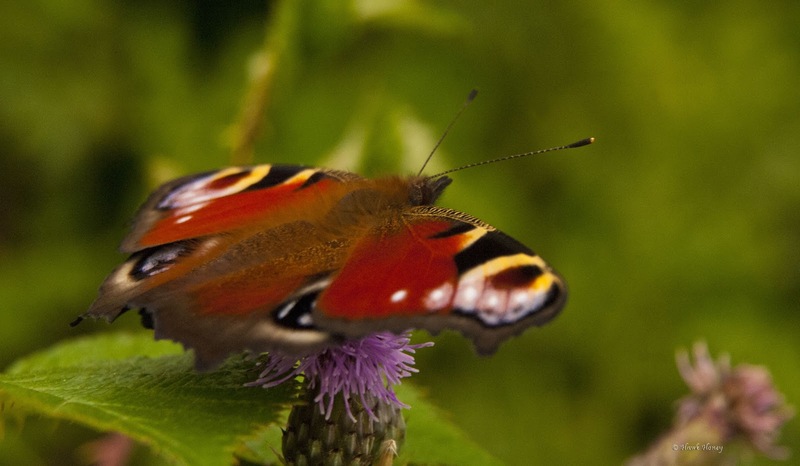 Peacock Butterfly feeding on thistle. There were a few dragonflies zooming about too, but unfortunately, they were to quick for me to identify, all I could say is that they were hawkers. There were some nice Common Blue Damselflies about as well and I just love the richness of the blue on these guys. These can always be confused with Azure damselflies and to tell them apart without catching them, you need a good pair of close focusing binoculars. Using these, you can get a better look at the marking, where in this case, you would have spotted that the Common Blue has a little black mushroom marking at the top of segment 2 of its abdomen. The Azure doesn't have that marking and you might be able to just make out the marking on the picture above if you look at the 2nd segment below the base of the wings. There were also Silver Y Moths (Autographa gamma) a plenty flying around in the bright sunshine. Only two weeks ago I got plenty of photos of these feeding on my buddleia by night. Do they ever rest??? 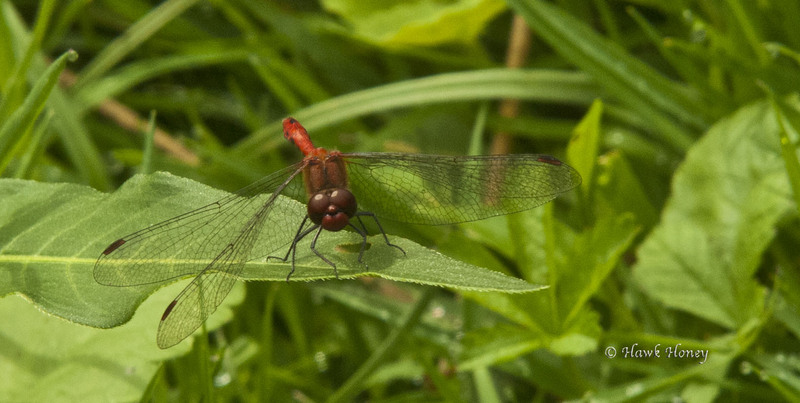 One dragonfly I did get to have a good look at was this little beauty, a Ruddy Darter (Sympetrum sanguineum). Ruddy Darter. Always remind me of Homer Simpson for some reason. I also managed to see a couple of White Egrets flying about and as many of you know, I'm not really in to birds that much, so I couldn't tell you if it was a small or large egret, but it was definitely an Egret. Eventually, I got to the small peat ponds near the end of the route and whipped out the bins to start looking for the very thing I came for, a Raft Spider. No luck at the first two ponds, nor the couple after that. Even the four more I came across after the first four lacked any visible signs of a spider. Now, I'm not saying there were no spiders there, it could be that I wasn't getting my eye in and they could've been well hidden from view. But, sadly, I did not get what I came for, but I did go away with something else instead. 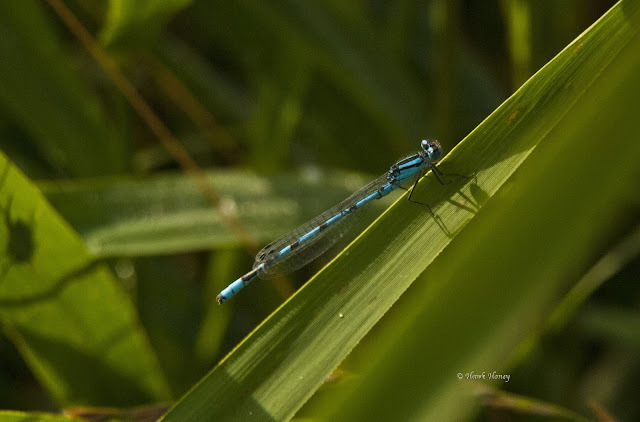 On the last pond I came to, I saw a damselfly. At first I thought it was a common blue, but it didn't look right. Looking through the binoculars I could see that it was blue, but it was also emerald in colour along the abdomen and on the dorsal thorax. 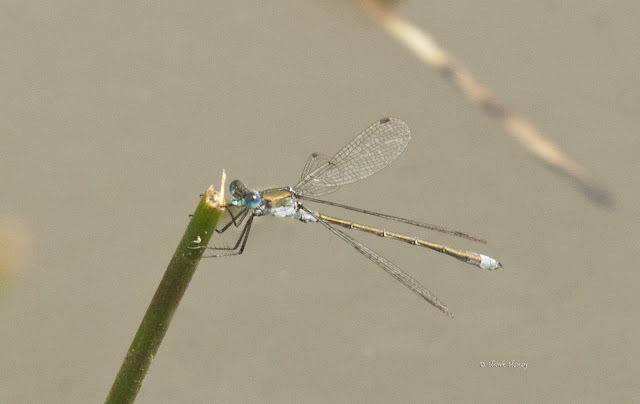 An Emerald Damselfly (Lestes sponsa) me thinks, but was it? Getting back to the car I decided to have a proper look at the photos I took of it and compare them to the Dragonflies and damselflies field guide I have on my phone. The Emerald Damselfly has quite an extensive range covering most of the UK, but it also has a similar species, the Scarce Emerald Damselfly (Lestes dryas) who's range is confined to the Thames estuary, west Norfolk and west Ireland. Usually, in these circumstances, I would say that it must be an Emerald, however, when looking closely at the pictures, there are a couple of subtle differences I observed. The first one was that the thorax at the base of the wings is darker on an Emerald than a Scarce Emerald. The second difference is that pterostigma (the black segments on the wing tips) are narrower on an Emerald than a Scarce Emerald. The third thing I noticed in my couple of differences is that Lopham Fen is the most southern point of it's Norfolk range. So I strongly believe that what I saw that it was in fact a Scarce Emerald Damselfly. So I may have not got what I went for, but I came away with another reward instead and to top it all, it was a lovely mornings stroll to. Lopham Fen is a place I would recommend for all the family, I have just one little gripe about the place and that is it's missing a café. It's a lovely place and people like to sit down and have a cuppa whilst talking over the things they've seen after there walk. A café also encourages people to meet up there prior to walks and birding etc. So come on Suffolk Wildlife Trust, what about installing a café? A couple of days ago, whilst making a cup of tea for the dear wifey, she pointed out a fly on the window trying to get out. I said it looks like a wasp, but no, she reckoned it was a fly. On closer inspection (and I hate to say this) she was right, it was a fly. At first I thought it was a hoverfly, but I had trouble trying to ID it and thought it might be a Chrysotoxum cautum hoverfly. Not truly believing my ID, I turned to Twitter and posted a picture to Martin Harvey, a hoverfly specialist and someone who's contributed to this blog, with the question is this C cautum? It wasn't long before another fly specialist I know and someone who has a regular slot on BBC Radio Suffolk's Lesley Dolphin show, John Biglin tweeted me back with a surprising answer. "Looks like Stratiomys potamida to me" he tweeted. Looking this up I found him to be right and I also found out that it wasn't a hoverfly, buit it was in fact a soldierfly. Martin soon got in touch and asked me to send him the record details i.e. date/ grid ref. Two days later Martin contacted me to say that this soldierfly was last recorded in my 10km square back in 1894, over 100 years ago (119 to be precise). Stratiomys potamida. The tissue is there to keep it still for the picture. It doesn't harm it. So it just goes to show, we never really know what's out there unless we look, find and record. I saw a lady called Vanessa, she was painted beautifully. Yes, this week, whilst sitting in the garden having a cuppa, I looked up and noticed something different on the buddleia bush. I thought at first is was a rather large looking Small Tortoiseshell butterfly, but no. It then suddenly dawned on me what it was and as quick as my ageing limbs would carry me, I nipped inside for my camera to grab a picture of my first Painted Lady (Vanessa cardui) butterfly. The beautiful Vanessa. 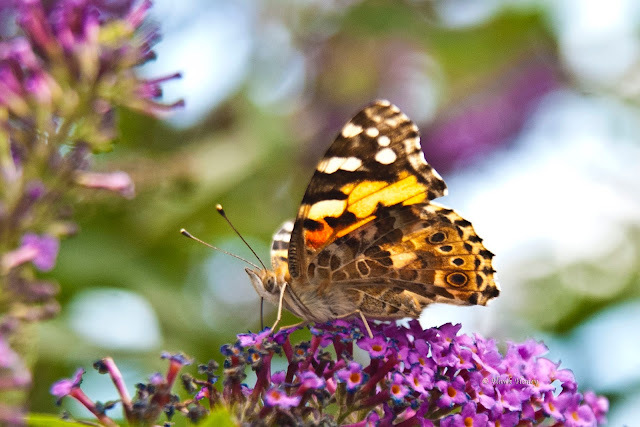 Vanessa cardui or better known as a Painted Lady. These butterflies have an amazing lifecycle that originates in North Africa. Come spring they migrate northwards from North Africa and start arriving on our shores around late March. They don't arrive as singles, no, they arrive in clouds. Many people were spotting orange coloured clouds just off the coast of Norfolk just above the sea a few years back. They then spend their summer here mating before flying upwards to the dizzying heights of around 5000ft where they catch northerly winds which help blow them back towards North Africa where they overwinter. Such an amzing feat for such a dainty looking butterfly. Well, four of the five are now pupating and I managed to find the fourth muncher at the top of the flexarium, which meant he was ready to start digging. So I placed him in the soil tank and set my camera up to do a time lapse of him burying himself. Alas, he was in no mood to wait for an amateur like me, so I only just caught hime disappearing under the soil for winter. That's all for now, hope you've enjoyed it. Catch you next time. Great Painted Lady info Hawk. I was wondering the other day how high a butterfly could fly and you've sort of answered my question!